For many years now, the produce industry has been awakening to the value of intellectual property (IP). For those already involved, the degree of time and money invested to bring licensed varieties to shelf is palpable. Of course, there are upsides — licensed varieties command a price premium, as they are superior products. However, the effort to maintain this premium is not without its own challenges. In the latest World Apple Review published by Belrose in 2018, it was identified that there is a worldwide trend of price deterioration across the apple and pear category. Now, the premium a licensed variety commands (or its varietal equity) is traditionally identified as a percentage above the equivalent commodity price. So, given that the commodity price is deteriorating, so too is varietal equity. Now generally speaking, breeding programmes and licensors profit from IP through royalty payments, paid by licensees at the other end of the supply chain. These royalties are also percentage-defined but are predominantly calculated from plantings and production as this de-risks the breeders from in-market price fluctuations. Combine the price deterioration trend and royalty payment requirements and a problem emerges: at some point there is a risk that the return to growers will not justify the return to breeders. However, there is a solution. A solution that Freshmax’s IP subsidiary Innovar is increasingly focused on. It involves taking both your initial and ongoing investments in building brand equity very, very seriously. Do this, and over time you will see your premium return expand and potentially even exceed those achieved by varietal equity alone. 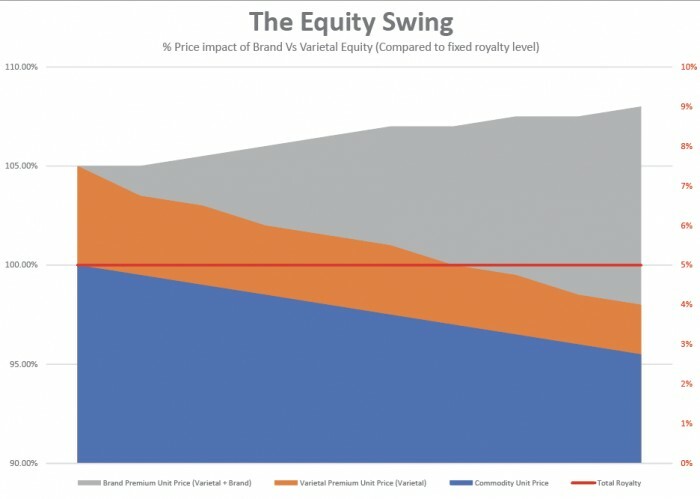 This is what we at Innovar refer to as the brand vs varietal equity swing. To beat the swing, you either have to build a brand that will outlast it, which in produce is often a 15-20 year lifecycle, or be willing to refresh (not replace) the brand along the way. Take Driscoll’s for example; their brand refresh a few years ago will have had a huge impact on their overall brand equity. More relevant to the apple and pear category, when I was heavily involved in the governance of the Dazzle apple brand development project last year, we challenged the brand development and research agencies appointed to unearth the themes and characteristics that appealed pan-region and pan-generation, ensuring that its positioning will last the lifecycle. Equally, and more recently, Freshmax’s Modi apple tagline ideation project will deliver depth to the brand’s resonance with consumers young and old. We must always make choices that benefit a brand’s equity by choosing what will appeal to the consumers of the future. But remember too, that being driven by brand equity also makes sense from a bottom line perspective. Investors consider brand equity as a stand-alone part of how a business is evaluated. As of March 2017, Apple Inc had a brand value of US$234.6bn and a US$922bn company value. That’s a 26 per cent brand equity, which is incredible. Now granted, comparing the brand equity of a tech giant with fresh produce is a stretch. But the principle is not. Take Pink Lady Apple Europe as brand example: even if we only assume a brand equity of 2.6 per cent (one-tenth of what Apple Inc achieves), the value of this fresh produce brand beyond its revenue is still significant. We have a long way to go as an industry in understanding and operating to drive brand equity – but go there we must. My advice – always think bigger and bolder, and always look further ahead. Because a brand decision is one you want to get right. This article originally appeared in the Autumn 2019 edition of Produce Plus Magazine.